Novozymes and the National Renewable Energy Laboratory (NREL) have successfully concluded a four-year, $17.1 million initiative to reduce the cost of enzymes required to produce fuel ethanol from biomass waste to $0.10–$0.18 per gallon—a 30-fold reduction since 2001. This reduction from the starting point of more than $5 per gallon in 2001 is due to a combination of pre-treatment technology developed by NREL and novel enzyme solutions from Novozymes. The drop in enzyme cost, although currently implemented on a laboratory scale, is a major step forward for commercializing large-scale biomass-to-ethanol production. An earlier NREL estimate placed the potential ethanol that could be derived from corn stover alone in the US at some 4 billion gallons per year. These new enzyme systems are the key to the future growth and geographical expansion of the fuel ethanol industry into areas where cereals are not readily available. In 2006, we expect to initiate testing of Novozymes’ enzymes solutions at our biomass fractionation process development pilot plant in York, Nebraska, USA to validate the technology’s performance. As one of the biggest ethanol producers in Europe and the USA, Abengoa Bioenergy is committed to the development and commercialization of biomass-based fuel ethanol production technology for a more sustainable transportation sector. Globally, ethanol is currently produced mainly from starches (converted to sugar) and sugars. In the US, corn is the primary feedstock; in Brazil, it is sugarcane. Production of ethanol is straightforward: simple enzymes break down starches to simple sugars which are then fermented into ethanol. Breaking down the cellulose in biomass waste is more complex and costly—the biomass is more “recalcitrant”. Special enzymes are critical to breaking down the different cellulosic structures in biomass to a sugar that can then be fermented into ethanol, but not sufficient unto themselves to make the entire process viable. 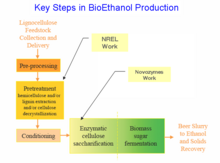 Successful commercialization of the biomass-based process for production of fuel ethanol and other useful products will still depend on further refinements of the enzyme technology, establishment of a formal collection system for biomass, further progress in overcoming the technical barriers in biomass pre-treatment, optimization of current yeast organisms, and financial incentives for industry to invest in facilities utilizing biomass instead of corn starch as feedstock. Novozymes will apply its expertise in the conversion of corn stover and other biomass feedstocks in broader industrial applications beyond fuel ethanol—possibly even the use of corn stover as an alternative feedstock for products currently derived from petrochemicals. Genencor and Iogen are also developing enzyme systems for the production of cellulosic ethanol. The link labeled "Ethanol from Cellulosic Materials" is busted. ... as is the third link in that series, "Recent Results in Pre-treatment Research". just an addendum--in addition to Iogen, which already produces (heavily subsidized) cellulosic ethanol in canada, BCI is currently producing cellulosic ethanol in the US. The two companies use slightly different technology, and it sounds like the Novozymes/NREL process is going to be cheaper. Cellulosic Ethanol has come a long way. But there is still no clear cut indication that Ethanol is going to anywhere near as easy or as economical as the starch based product is. The present technology has as to recognize the fact that the pressures and temperatures are going to have to come down before it can be realistically considered.